You are here: Home › Tech › Comparison between 03-05 Dodge SRT-4 stock throttle body and MPx 62mm with spacer. I came across a factory stock throttle body from a 03-05 Dodge SRT-4 today. So, for kicks, I thought it would be neat to show a comparison between the factory throttle body and the MPx 62mm throttle body. For those of you who are not familiar with the stock 03-05 SRT-4 throttle body, it consists of two pieces. a throttle body that looks like most throttle bodies, and in between the throttle body and the intake manifold is what we call a spacer. The spacer is a simple aluminum plate that the throttle body mounts to. 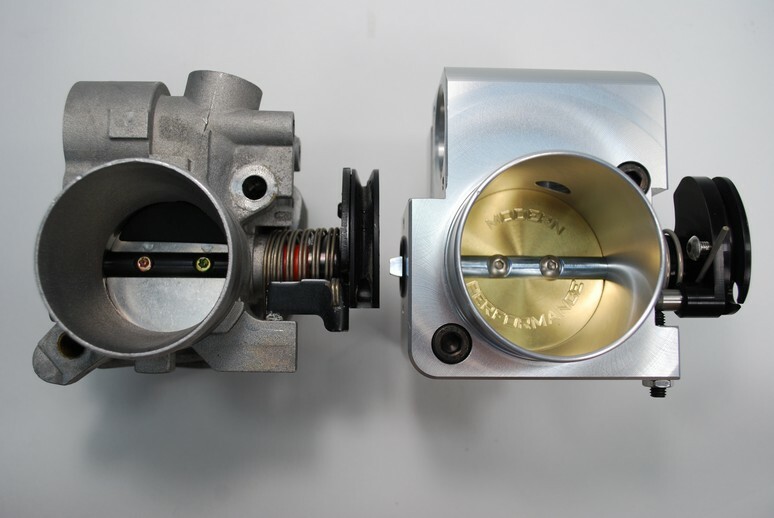 Heres a photo comparing the factory throttle body on the left, and the MPx 62mm throttle body on the right. 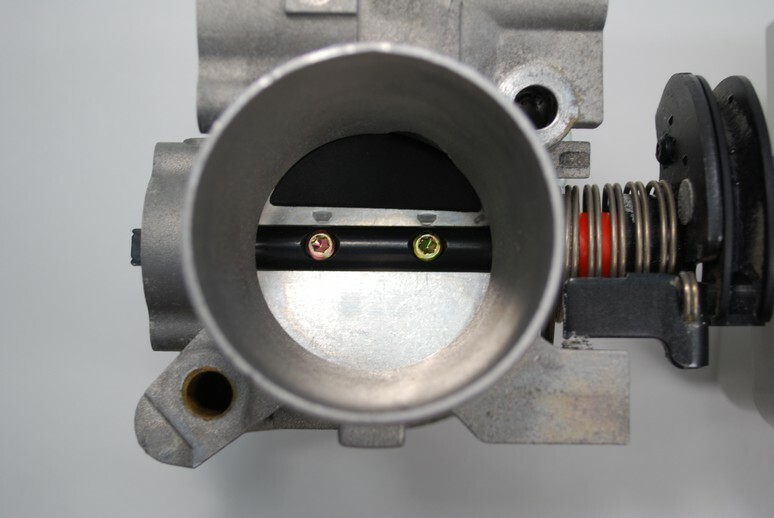 Closeup of the stock throttle body. Look at the difference in inlet size. 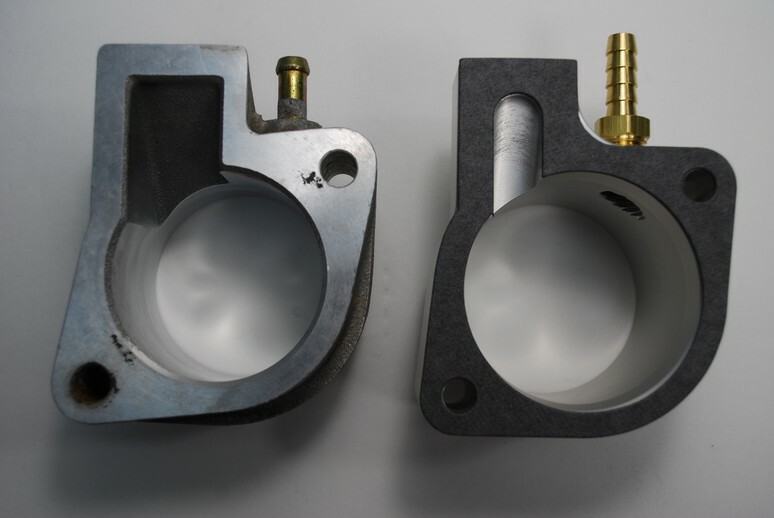 The factory throttle body inlet necks down to 52mm at its smallest size. The MPx throttle body inlet is 62mm. This difference in size allows a far improved throttle response, as well as more incoming air into the motor. The larger amount of air allows for an increase in power because the motor compensates for the additional air by adding more fuel. So, one part not only increases power by nearly 9-10 horsepower or more, but it also improves the acceleration/throttle response greatly! Boost control for 2003-2005 Dodge SRT-4 – Control boost by gear !